Kathleen Zeren Landscape Design (KZLD) can save you time and money by getting your site and subdivision landscape plans approved in a timely manner. We know municipal landscape ordinances! Kathleen has worked in enforcing, writing, and complying with landscape ordinances for over twenty years. Her beautifully executed plans are sophisticated, professional, accurate, highly readable, and make good horticultural sense. All required plant keys and notes are provided. Other team members have similar ordinance experience. Plans are prepared in AutoCAD. Let us increase your curb appeal by transforming your existing property with beautiful plantings, sweeping bed lines, and other exterior enhancements such as walks, picnic areas, and lighting. A good design can direct traffic and entice passersby to enter. Our designs are well-thought-out, sophisticated, and very practical. 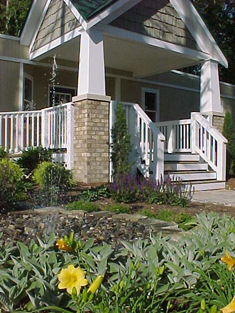 Our experience designing public right-of-way and streetscape plantings is extensive. 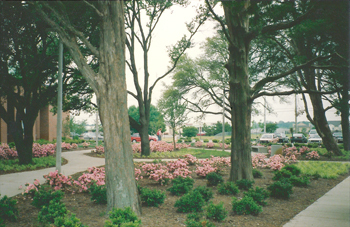 Kathleen worked for The City of Virginia Beach for years designing public spaces. She had a five-year contract with The City of Suffolk designing public spaces in that city. Our team has designed practical and beautiful plantings and right-of-way improvements for commercial areas, highways, parks, pump stations, and entry signs. 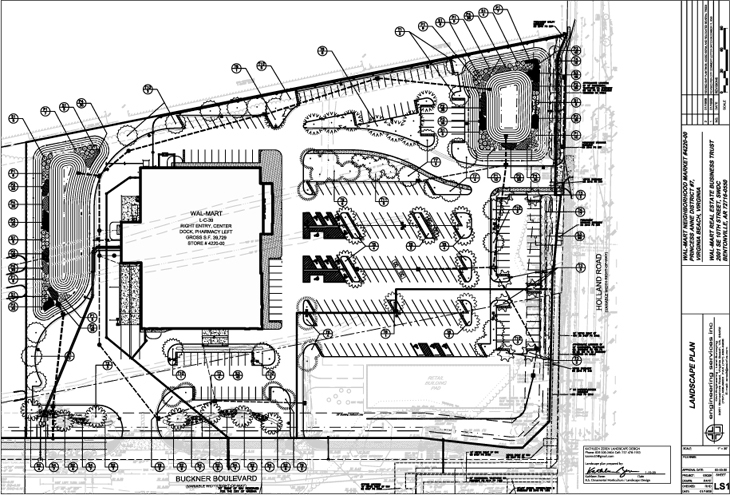 There are special considerations in designing public properties, and our team excels at this. Our projects are designed for the long-haul: In-scale, practical, easy to maintain, with a view to the future with long-lived plant species of interesting varieties. 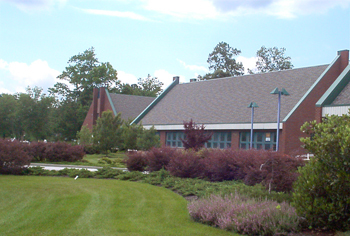 We have many examples to show you: Police stations, fire stations, libraries, recreation centers, and more. This is our legacy that we’re leaving to future generations! We are skilled in on-site wetland delineation and creating quality riparian area landscapes that enable use and enjoyment of waterfront properties while achieving desired or mandated natural resource preservation and protection. Our team enjoys the support and services of a twenty year veteran of local government wetland regulation in Hampton Roads and regulation of Chesapeake Bay Preservation Areas. He has a degree in the field of Biology with a concentration in Ornamental Horticulture. This combination of education and experience enables the Team to quickly and accurately identify and characterize environmentally sensitive features in the landscape and to effectively assess applicable regulatory constraints and opportunities. We can then design and implement innovative, functional, and approvable site improvements. Get more for your money by having us inspect your installed landscape plantings to ensure compliance with approved plans, specifications, and acceptable horticultural practices. We make sure that the correct plant varieties are provided, at the correct sizes and layouts, and with the proper planting procedures. A punch list letter is provided and followup inspections help ensure that the plantings provided will give you years of beauty. Inspections are affordable and really pay off in the long term! Our tree experts will identify and evaluate your existing trees and shrubs and will make recommendations for tree preservation or removal. We can increase your chance for success in preserving existing trees with site layout and tree protection recommendations. Optimizing tree health with proper pruning and other maintenance work may also be recommended. We love trees! Our team will take your project of any scope and get it from concept to completion, competently, affordably, and in a timely manner. We estimate costs of labor and materials for planting, hardscaping, lighting, and irrigation systems. We negotiate bids, prepare contract submittals, prepare contract documents, and secure contracts. We coordinate on site with owners and other contractors. We schedule crews and supervise and evaluate work of subcontractors. We get it in the ground right – and on time! Ensure that all of your bidders are using the same quality criteria and good horticultural practices by providing installation specifications. Simplify inspections and make sure that your new plantings do well by making it clear up front that you want the work done correctly. Budget your project in advance with cost estimates. And let us create design guidelines so that your project turns out as beautifully as you anticipate! Taking the guesswork out at this stage will help avoid unpleasant surprises! We can also provide maintenance guidelines. We can provide drafting, designing, and planning tasks using Auto-desk software. Our draftsman, Grey, has experience in Civil 3D (2007-2009), Land Desktop Design (2002 & 2007), and AutoCAD (2002-2015). He will work with your Engineers and Surveyors to draft water, wastewater, storm water, road improvement, and commercial and private development plans for any scale project. 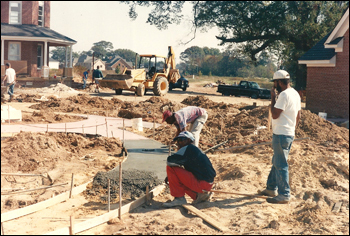 He can perform landscaping, site grading, erosion control, and detention pond system drafting projects. Grey is available to draft complete, detailed, and accurate working development plans, construction documents, utility plans, grading plans, charts, ALTA surveys, topographic mapping, and subdivision platting. He loves what he does, is good at it, and is very easy to work with.